Israeli flags were burned and signs announcing upcoming Independence Day events were torn down in Israeli-Arab towns across the country over the past few days, as some Israeli Arabs protested against ceremonies in the Arab sector marking the 70th anniversary of the establishment of the state. Three Arabs from eastern Jerusalem were arrested on Monday after they burned Israeli flags in the predominantly Jewish neighborhood of French Hill. Residents spotted the three torching the flags, and notified police, who apprehended the trio. 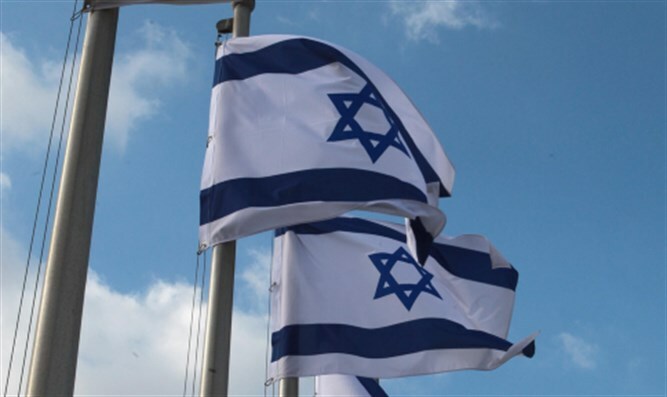 The suspects were found to be carrying two burnt Israeli flags and lighters. "The Israel Police will respond with without compromise to any attempt at damaging the symbols of the state, with emphasis on offenses committed deliberately and publicly on the occasion of Independence Day celebrations and that may violate public order," a police spokesperson said in response to the incident. In Israeli-Arab towns in the Galilee and Negev, signs for Israel’s 70th Independence Day were torn down. "In the past few days, Arab media sources have been harshly criticized for publishing ads for the 70th anniversary of Israel's independence,” Jafar Farah, Director of the Mossawa Center, told Yediot Ahronot. “Hundreds of posts have been published on social networks calling for the removal of such signs from message boards in Arab towns, the same goes for the print and electronic media and newspapers that publicized the notices were harshly criticized. In some places, the signs were vandalized by unknown perpetrators." Some residents, said Farah, supported marking Israel’s establishment with Nakba [Disaster] Day events to mourn the establishment of the Jewish state. Israeli Arabs make up 21% of Israel’s total population, with roughly 1.8 million people in pre-1967 Israel and eastern Jerusalem. More than 80% of Israel’s Arabs are Muslims, with the remainder divided between the Christian and Druze communities. According to a 2017 survey by the Israel Democracy Institute, just 10% of Israeli Arabs identified primarily as Israelis. Only slightly more – 14% - identify primarily as “Palestinians”. The vast majority of Israeli Arabs identify primarily as either Arabs (39%) or with their religious community (34%), as Muslims, Christians, or Druze. While some sectors of the Israeli Arab population, including Druze and some Bedouin communities, send their young men to serve in the IDF, most Arab citizens are exempt from military service.